Supporting Buffalo Sabres Hockey since 1970! Booster Club of the Buffalo Sabres! The Buffalo Sabres Booster Club is always looking for new members and has several membership options available. All members receive discounts on club activities and have first priority on all club sponsored events, trips and activities. All members receive our monthly newsletter "Sabrespoints". Individual Membership: Open to anyone 18 or older. Youth Membership: Open to anyone under 18. Youth members must be accompanied by an adult to all club functions. Family Membership: This membership consists of two adults and any number of children under the age of 18 related by blood or marriage. International Membership: This membership is an individual membership open to anyone living outside of the United States. Memberships run from September 1st to August 31st each year. For an application please contact the Booster Club at our email address below or our mailing address listed below or use the link to the right. 7:30 pm and are held in the media room. Members and guests must enter through the security entrance located between the parking ramp and arena at the end of the courtyard. ** Dates subject to change based on KeyBank Center events. Trips to other NHL cities to watch the Sabres play other NHL teams. NHLBCC - National Hockey League Booster Club Convention. This convention is held each August and is hosted by another NHLBC member. The 2043 NHLBC convention is in St. Louis, hosted by the the St. Louis Blues Fan Club. The Buffalo Sabres Booster Club is recognized by the Buffalo Sabres and National Hockey League. We have been in existence since 1970. We are a proud member of the National Hockey League Booster Clubs (N.H.L.B.C. ), an organization of booster/fan clubs supporting NHL teams in the United States and Canada. We have had the honor of hosting the annual NHLBC Convention 3 times, most recently in 2006. Check out this years autographed jersey raffle! Click the tab at the top of this page to find out more. 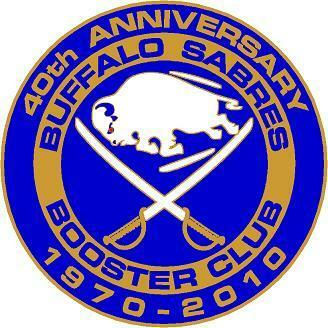 The purpose of the Buffalo Sabres Booster Club is to promote the Buffalo Sabres and the sport of hockey at all levels. The Booster Club is an active part of the Western New York Community raising thousands of dollars annually for local charities and organizations. The Booster Club has a booth located on the 100 level of First Niagara Center (near section 106). Members meet at the booth before the game and during intermissions to talk hockey and welcome incoming booster/fan clubs from other NHL teams. We also sell assorted Niagara Candy candy bars at the booth for only $1! The proceeds benefit local charities. We look forward to meeting other hockey fans.